From boiling water quickly to defrosting meat safely, a microwave can save you plenty of time in the kitchen. Because the units have such a large footprint, they can also steal a lot of your counter space. Before installing one over your stove, you should be aware of potential issues that could arise. A microwave mounted over the stove saves kitchen space. 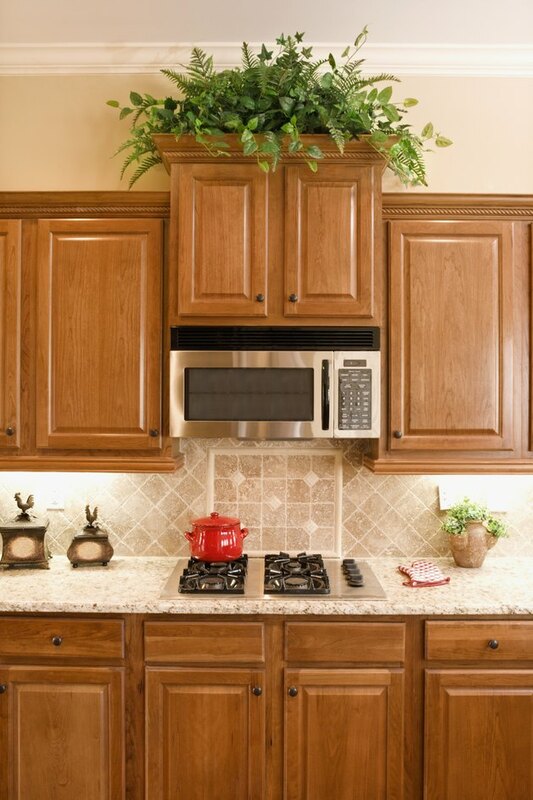 Over-the-stove microwave ovens are mounted onto the wall above your stovetop. They are favored because they get the microwave off the countertop or island, giving you more counter space to work with and reducing the appearance of clutter in the kitchen. Placing one over the stove also puts all your cooking appliances in the same general area, making your kitchen a more efficient workspace when cooking a large or involved meal. Over-the-stove microwaves must be correctly installed or they will cause issues. If the microwave is installed too close to the stovetop, you won't have enough room to work on the stove, which puts you at increased risks for burns. If the microwave blocks the area where you had a hood installed, you can't vent steam from pots of boiling liquid on the stove. Even if the unit is installed correctly, it can cause problems for children or people with decreased ranges of motion in their arms. The high microwave can be difficult to reach and use. When installing a microwave over the stove, verify that the distance between its bottom and the stove range is a minimum of 30 inches. Microwaves intended to be wall mounted come with vents on their underside; use it to vent your stove when cooking gets steamy. For safety's sake, an over-the-stove microwave can't be lowered. A step stool can help people better reach and use the unit. If you can't have a microwave placed as high as is necessary for safety, you shouldn't install it over the stove. Mount it over the counter in another area of your kitchen, or place it just beneath the countertop among your base cabinets. If your current microwave doesn't have a vent feature, either purchase a new one to install over the stove or mount your current unit somewhere other than over the range.